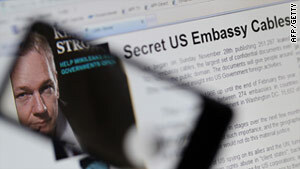 U.S. embassy cables obtained by WikiLeaks are being published on a website run by the Cuban government. Havana, Cuba (CNN) -- A Cuban government-run website has begun translating into Spanish and posting online leaked U.S. government cables that discuss the island nation. "Las Razones de Cuba" or "Cuba's Reasons" has as of Friday published seven cables originally released by WikiLeaks, the group whose leaks of confidential documents has been deeply embarrassing for U.S. officials. The translated cables detail meetings between independent Cuban bloggers with officials from the United States Interests Section, the U.S. diplomatic mission in Cuba. According to the "Cuba's Reasons" website, the cables show an attempt by U.S. officials to "organize youth networks to subvert the Cuban Revolution." The website promised to continue posting the leaked cables. Other cables released by WikiLeaks that detail U.S. officials' speculation on former President Fidel Castro's health and Cuba's economic woes have not been posted on the site. According to the website, WikLeaks possesses 2,080 cables that mention Cuba. Excerpts of some of WikiLeaks the cables have previously been published on Cuban government websites and in state newspapers. Although Cubans have access to the web in internet cafes and in some workplaces and schools, the internet is not widely available on the island.